Gets the job done if you're looking for a reliable product, just don't expect some of the high-end features like easy-set brakes or extra-cushy padding. The OXO Tot Seedling is a simple yet fun high chair that will suit almost any budget. It can accommodate babies ranging in age from 4 months to three years (up to 45 pounds). It features a colorful, easy to wipe clean seat cushion with moderate padding. The stationary crotch restraint, like the one featured in the Peg Perego Siesta is great for keeping babies in place while you remove the tray for cleaning. Additionally, the tray detaches nicely with a one-hand release and can sit flat on the counter while you double check to make sure baby is safe and secure in the 5-point restraint. Its varying height adjustments made it easy for baby to be fed while you sit in a chair, or raise her up to join the other kids at the kitchen island. Although it is on four wheels, we found them a bit small for easy maneuvering, but still manageable overall. Baby all harnessed into the Seedling. The shoulder straps are a nice safety feature, but can not be removed. The OXO Seedling is a fun chair that scored right in the middle of our pack of nine. We appreciated features like the easy to clean seat pad, self-storing tray, and stationary crotch restraint. If you are looking to keep things simple while not breaking the bank, read on to find out more about what worked and didn't work for us, so you can make the best decision for your family. OXO is a company that was founded in 1990 and stands by their philosophy of "Universal Design", meaning they are committed to making products that can be used by as many people as possible. Not only do they manufacture baby products, but also things like household cleaning tools, bar-ware, and office products. With more than 850 products, their company has seen steady growth since they were founded more than 20 years ago. When in the recline position, baby's fingers easily got in the way and were even pinched a time or two. The Seedling is a simple, fun chair that will have you wondering why other chairs seem to make things so complicated. 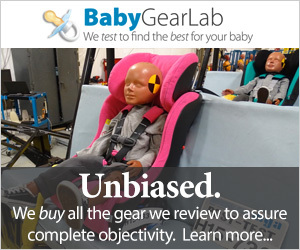 For our ease of use metric, we specifically tested whether or not the chair was easy to get baby in and out of, and this one was due to the stationary crotch restraint (meaning the post between baby's legs did not remove with the tray). Harnessing baby into the 5-point restraint was easy, as was adjusting the straps. Unfortunately, the harness did not offer a one-handed release, but this was not a deal-breaker for us, just something to be aware of. It also was unable to convert to a 3-point restraint, like the Graco Blossom was, so if you have an older child, the shoulder restraints can be a pain. Our baby seemed relatively comfortable in this seat's padding, however there were other chairs, like the Peg Perego Siesta, that offered a more padded seat, as well as a better footrest. There are three reclining positions, but please be aware to always have baby's fingers out of the way when reclining, as our little tot's hands got pinched on the way back up! This chair does not accommodate infants, only those babies over 4 months old, so for that reason, and the ones listed above, this chair earned a 5 of 10 for ease of use. The crotch restraint built into the seat is a nice feature, although the stitching in the fabric around it was a magnet for small food crumbs. Ease of cleaning is probably one of the most talked-about metrics in the world of high chair reviews. This chair, although it came in at about the middle of the pack with a 5 of 10, was quite simple to clean. However, it had competition like the Baby Bjorn and Keekaroo Height Right that just brought ease of cleaning to a whole other level. The Seedling offers an easy to wipe seat cover that also pops off and is conveniently machine washable. Although the tray is easy to wash, it was rather large, and somewhat heavy. This chair had the lowest price of all the products we tested in this category, but you wouldn't know it based on quality. OXO truly stepped up to the plate making an affordable, reliable option with this model. The frame consists of rounded metal legs and the chair is white plastic, perhaps not as chic as some of the wooden chairs, but certainly not an eyesore. Baby was securely supported when she was restrained in the harness, and we anticipate this would remain the case as she got older. The tray, which had several depth adjustments, allowed baby enough room so that she did not feel squished. The seat had high back support and was deep enough that baby could not climb out or tip out the side. The Seedling earned a 6 of 10 for quality. This was one of our easiest chairs to set up right out of the box, just under 6 minutes, and earning itself a 7 of 10 in ease of set up. No tools were required, something not only we, but many other reviewers, appreciated. It was so easy, in fact, we almost didn't need to read the manual. Of course, we encourage all our readers to always refer to the owner's manual of any baby product to ensure baby's safety. The small wheels would often not cooperate when rolling across tile. The Seedling struggled in our footprint and portability rating metric, earning only a 3 of 10 when compared to the other chairs. It's footprint was a whopping 726 square inches, whereas the Stokke Tripp Trapp only took up 396 square inches of space. If you will be using this chair in a kitchen that does not have a lot of room to maneuver, you'll definitely want to consider this factor. Additionally, it has four very tiny wheels, which at times were difficult to navigate around our tile kitchen floor. Each of the tiny wheels included an equally as tiny 'foot' brake, something we found to be totally impractical when trying to lock, and ended up having to bend down to set each of the four brakes by hand. And finally, it does not offer a folding option, but can collapse into several pieces if there is a need to store it. We also loved its ability to store the tray on the back legs when not in use. This is a great chair for someone looking to stay on a budget, yet still get a quality product for their money. This simple chair should last your toddler through age three, or 45 pounds, and comes in a variety of colors to match your kitchen. This is a good, basic chair for a fair price. With an average price tag of $120, this chair is a worthwhile the investment, in our opinion. In fact, it was our lowest priced chair, the next closest being the Fisher Price Rainforest, which retails for $140 and did not score nearly as well. Consider the Seedling for your baby if you do not need the chair to accommodate a tiny infant and a low price point is important. Keep in mind, however, it did take up the most floor space of the nine chairs we tested, and has a large, heavy tray.